Square watermelons are watermelons grown into the shape of a cube. 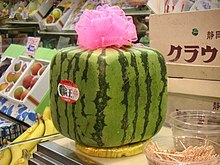 Square watermelons are common in Japan, but they are purely ornamental and are often very expensive, with prices as high as $100. Square watermelons were intended to fit more compactly in fridges and be able to be cut more easily (without rolling). They were invented by graphic designer Tomoyuki Ono in 1978. She presented the watermelons in a gallery in Ginza, Tokyo. She also applied for and received a patent in the United States. The melons are grown in boxes and assume the shape of the container. They tend to appeal to wealthy or fashionable consumers because in 2001 they cost anywhere from two to three times a normal watermelon (at about $83). Since the advent of the square watermelon, other watermelon shapes have been introduced, such as hearts and pyramids. They are also available in other countries now, such as in Germany. ^ "Square fruit stuns Japanese shoppers". BBC. 15 June 2001. Retrieved 31 July 2015. ^ "A de-vine idea: square watermelon". Reading, Pennsylvania. Reading Eagle. 15 June 2001. p. B10. Retrieved 31 July 2015. ^ Allen, Rick (3 August 2006). "Watermelons are nature's sweet way of fending off summer's heat" (63.337). Ocala, Florida. Ocala Star-Banner. pp. 1C, 4C. Retrieved 31 July 2015. ^ Pinchko, Alexey; Mingazev, Sergey (6 November 2013). "Square watermelons Japan. English version". YouTube. YouTube. Retrieved 19 June 2018. ^ "Square fruit: Odd-shaped melons herald Japan summer". CTVNews. 4 July 2015. Retrieved 31 July 2015. ^ Paton, Callum (3 July 2015). "Japan: Heart-shaped melons go on sale as part of country's tradition of extravagant fruit gifts". International Business Times UK. Retrieved 31 July 2015. Maurice Chin (March 2006). Grow Your Own Square Watermelon. MMC Associates. ISBN 978-0-9780399-1-2.